If you have been waiting to acquire a chronograph, it may be time to buy. Brownells.com now has the popular new MagnetoSpeed Sporter Chronograph in stock for just $179.99. This Sporter model shares most of the capabilities of the $399.00 MagnetoSpeed V3, but at a much, much lower cost. Like all MagnetoSpeeds, the Sporter is easy to set up. Just attach the unit to your barrel with a strap and toggle clamp. There is no need to go downrange to set up tripod and skyscreens, or run wires. What’s the downside? The manufacturer says the Sporter is limited to 1″-max diameter barrels. In actuality, it can go a bit bigger than that. We have used it successfully on a 1.15″ straight contour barrel — but “your mileage may vary”. Second, the manufacturer says the new Sporter is NOT designed for use with airguns or shotguns. We have tested the original MagnetoSpeed with air rifles and it successfully recorded .177 and .22 pellet velocities, once we adjusted the sensitivity. 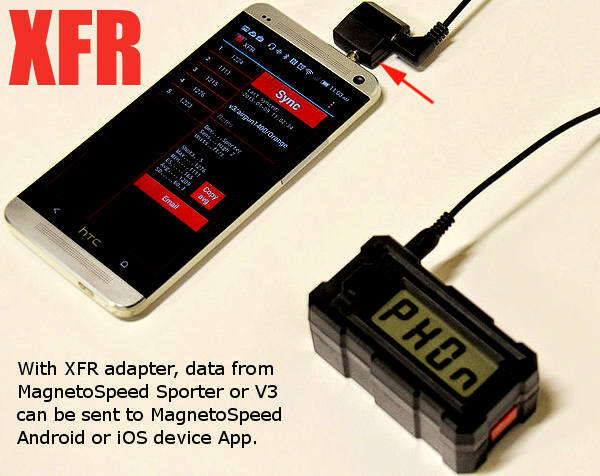 With MagnetoSpeed’s $24.99 XFR adapter and associated Apps, you can download your current shot series from Sporter and V3 chrono displays to an Android or iOS device. Once synced, users can rename the current shot series, delete irrelevant shots, email the data, reconfigure the display settings (units and sensitivity level), and clear the display’s current series. 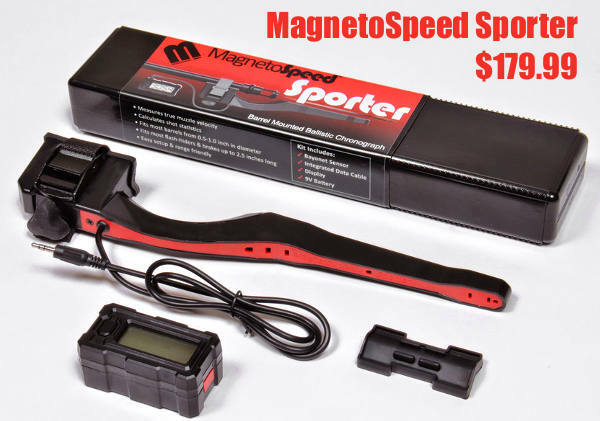 Share the post "MagnetoSpeed Sporter — $179.99 at Brownells.com"
Anyone used this successfully with 1″ barrel? Very reasonable. May end up with one yet. The largest barrel diameter I have tested is .820 and I have tested rifles in 204, 22-250 & 308 calibers at that diameter. I have owned used an Oehler 35, Pact Timer/chronograph, and a Shooting Chrony before I got the MagnetoSpeed Sporter. None of the first three are as quick and easy to set up and use as the Sporter. I may well sell all of the first three now.